When it comes to cleaning, what matters most to the customers of building service contractors in 2016? To find out, Contracting Profits surveyed facility executives from commercial office buildings. According to the results, respondents have the same expectations as they did two years ago. Comparing the data to Contracting Profits’ 2014 survey of the same audience, not much has changed. A healthy and sanitary environment still matters more than a clean appearance or a low price. Facility executives continue to want to hire contractors who practice sustainable initiatives and pay their janitors a living wage. The restroom remains the biggest focal area of a facility. 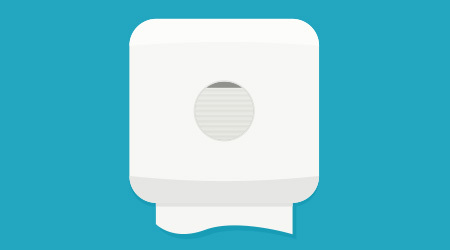 Cleaning and stocking restrooms are the most important service BSCs provide. Restroom problems account for two of the top three complaints, just as they did two years ago. While many of the answers are similar to the last survey, there are a few changes. More facility managers recognize the importance of knowing who is cleaning their buildings. The numbers of respondents wanting janitors to wear proper uniforms and identification badges both increased over 2014 results. 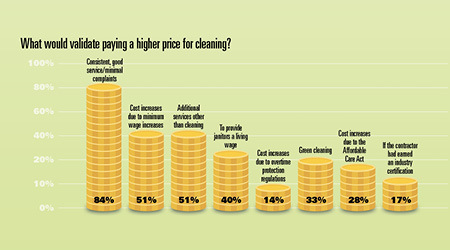 More facility managers are willing to pay a higher price for cleaning if services are consistent and they don’t receive complaints from building occupants. However, fewer facility executives are willing to pay a higher price due to minimum wage increases, which may affect BSCs’ margins since many states and cities are discussing raising minimum wage to $15. The survey also reveals what add-on services facility executives are most interested in, how much industry certifications matter, whether cleaning frequencies will increase, and more.